The cell is a multifunctional and multitasking structure. It can make all four classes of macromolecules: proteins, lipids, carbohydrates and macromolecules. But it still needs to import the necessary components for production from outside, such as water and small molecules. There are also lipids and proteins entering and exiting the cell constantly. To achieve such active traffic, the cell needs effective transport mechanisms. There are many conditions that determine what can pass into the cellular membrane and how. These processes are determined by the properties of the cellular membrane itself. The cellular membrane is unique and has two major features that greatly influence everything that goes around the cell and inside it. The cellular membrane is semi-permeable. The structure of its main component – the lipid bilayer – allows only the small and non – polar molecules (i.e. molecules without a charge) can pass freely through it. The cellular membrane is selective. Besides the lipid bilayer, the membrane has another strict controller – membrane proteins. They are responsible for “feeling out” the surroundings and they let only certain substances through. The molecules that can pass through the bilayer without assistance are travelling with the help of passive transport mechanisms. The large and polar molecules (for example, ions) can travel with the help of active transport – the mechanism that is fully controlled by the cellular structures and requires energy. Why does it happen this way? Because the laws of physics are at work here! For us, the smell is the “feeling”, but actually, we can sense the smell because small molecules bind with our smell receptors and create the sensation we identify as a “burning smell”. At first, when the eggs got burned, it has led to multiple “burning” molecules rising in the air. But they did not stay in place. They began to slowly move to the areas when there were no molecules at all. This process is called diffusion. According to the law of diffusion, the molecules would always move according to the difference in concentrations, which is also called the concentration gradient. In diffusion, there would always be movement from the area with high concentration to the area with low concentration, i.e. where the gradient is lower. The same thing happens in the cell. We have two sides of the cellular membrane. There are many molecules of a certain type on one side of the membrane, and quite a few on the other. And if those molecules are not charged and are small enough or are lipophilic (can be dissolved in fats), they can slowly move from the one side where the concentration is high to the other side of the membrane, where the concentration is low. Water passes through the membrane with the help of the special type of diffusion called osmosis. Water often serves as a solvent – it dissolves other molecules. But when a cell is surrounded by a solution, bigger, dissolved molecules cannot pass, while water molecules can. If the cytoplasm lacks water for some reason, and the concentration of water molecules is higher in the solution around it, then the water would enter through the membrane. If this process is not restricted in any way, there is always a risk that the cell can burst. In relation to the cell, such solution would be called hypotonic. And in reverse, if the cell is placed in a hypertonic solution – where the concentration of water is higher in the cell – then the cell would be rapidly losing water and would shrink. 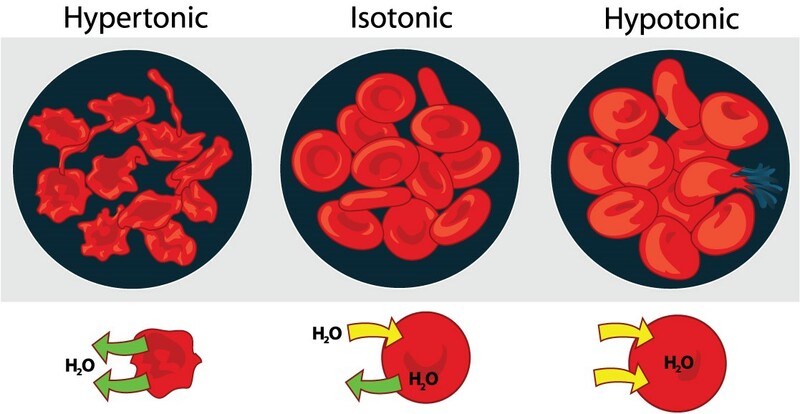 In order to preserve the water inside, the best environment for the cell would be an isotonic solution – where the concentration of water would be equal outside and inside. Osmosis is especially important for plants. It is the essential mechanism that allows the plant roots to absorb water from the soil. Osmosis also contributes to the inner pressure in the cell, i.e. turgor pressure. When the water enters the plant cell, it mainly goes into the central plant vacuole. As the water fills up the vacuole is stretched, and becomes bigger. It becomes similar to a balloon filled with air – when it is blown just right, it is very firm to the touch. This process is crucial for the ability of plants to preserve their shape and stand upright. Both osmosis and diffusion have their advantages. As the molecules move along the gradient, the cell does not have to spend any energy to move them itself. Active transport: the warriors fighting the gradient. But we have not mentioned large and charged molecules yet! What about them? This is where the transmembrane proteins come in. They have outer parts that usually contain receptors – special structures that recognize the molecules they can carry across. Then, as the receptor comes into contact with the right “passenger”, the protein changes its form and brings the molecule inside the cell. If the protein works against the gradient, it cannot work unless some energy is spent in form of ATP molecule. This process is called active membrane transport. If the protein brings a molecule along the gradient, it would be called facilitated diffusion. As you can see, there are various mechanisms the cell can employ to get the supplies it needs. Cellular transport is important for many crucial processes in the cell. If one of the mechanisms fails the cell, it can die.